A pretty good movie, this one has some great stuff towards the beginning and a fantastic dragon segment at the end, but it’s the mid-portion that sometimes gets too bogged down and slow. The Hobbit: the Desaulation of Smaug is a pretty good film. It’s great in the ways that all the other Lord of the Rings or Hobbit movies are great, which is to say visuals, action, scenery, and epic scale. But as far as storytelling goes, this one definitely reaches some points of moving too slow. The three hour running time really hurts and so does the way the action is spread out so that it pops up only about once an hour. Still the action is pretty thrilling, especially the final portions of the film, featuring the dragon himself in all of his glory. This is definitely a solid film that would have benefited from trimming some of the fat and being a little tighter. It’s a weird thing to know that a movie is good, but also feel like it could have been a whole lot better. On the one hand, you admire the visuals and the spectacle, but on the other, you can’t help but think about what might have been if some serious changes had been made. The Hobbit: the Desaulation of Smaug is such a movie. It’s the fifth peter Jackson-Middle Earth movie, and despite them all being three hours long, this is the first one where you start feel the length. There is no question, the movie should have been shorter and tighter. Lots of people said these same remarks about the first hobbit movie, but that one was about establishing the world, the characters, and the quest. with this movie, storylines definitely start to feel like they’re being dragged out. It is about a thousand times better than the film that follows it in the series (The Battle of the Five Armies), but with this movie you can begin to see where the cracks are starting to form. The problem people have with this whole trilogy is that it was made from just one book. with the lord of the rings movies, there were three books, so it made sense to make three movies. there was enough story there to tell in three films. here, doing that same thing is a bit of a stretch. aside from three movies, it doesn’t help that each movie is three hours long. that length is just peter jackson stubbornly trying to prove a point, showing everyone that he needed to make three movies because he had so much to put into each one. it’s too bad, because if he did more cutting, this could have been a far better film. the trilogy also could have been cut down to two great movies instead of two good ones and one lousy one. while the length is a problem, there is also plenty to like and appreciate here. the action and the fantasy environment, are of an epic scale, and are pretty great. basically the same things that are always spectacular with these middle earth movies. this j.r. tolkien world is the greatest fantasy series of our generation (whereas star wars was the great fantasy series of the generation that came before us.) peter jackson is a master craftsman when it comes to visuals and he shoots scenery like nobody else. in this movie, his camera moves all over the place, through tunnels and mines and hallways and woods. it is all pretty remarkable and beautiful to look at. jackson is also great at shooting action. the story here is basically composed of three parts, each stretching out to one full hour. there is action in all three parts, although the action scene of the second part comes at the very beginning of that segment, leaving us for the next hour with nearly no excitement at all. let’s start with the beginning. the hobbit, named bilbo (martin freeman) and his dwarf buddies are continuing on their way, going through the woods, when they stumble upon a group of giant spiders. this starts the first action scene of the movie. the spiders are monstrous and exciting, but we’ve seen these exact same creatures before, with shelob in the third lord of the rings movie. instead of one spider, this time we get about ten of them, but even still, a new creature would have been a whole lot cooler. i don’t know if the spider attack scene was in the book or not, but at this point it certainly feels like jackson is making up a lot to fill his nine hour running time of the series. still, the spider scene is cool, so whether it was in the books or not, it definitely helps keep the movie fun and exciting. following the spider scene, our characters are rescued and then imprisoned by the wood elves. these include legolas (orlando bloom), and his father. they also include a new character, tauriel (evangeline lily), who jackson invented for the movies. i have no problem with that. tolkien’s books were light on female characters, and so adding one to help spice things up a little doesn’t hurt anyone. it’s the least of our worries here. 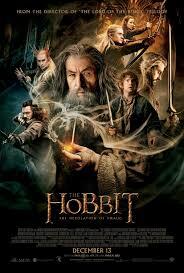 by the end of the first hour, the dwarves and hobbit escape and we get the best action scene in the movie. but now we are in the mid-section of the movie and it suddenly becomes a little slow. this is where the dwarves cross paths with girion, the bard (luke evans), and he has to hide them and bring them ito lake town, where he and his family live. it’s a sort of village of humans, where everything happens quietly. maybe the slowness of this segment is intentional, to make smaug seem all the more exciting when he shows up in the third hour of the film, but more of this section could have been cut and more action could have been included. in the third part of the movie, we meet smaug, the dragon. he is incredible. this is absolutely one of the most amazing creatures ever put on film. i like the way we slowly build up to seeing him in full form, starting out with just an eye, and then watching gold coins fall off his body while he stays asleep. the smaug scenes are fantastic, including the way he moves around and his voice (by actor benedict cumberbatch). the only problem here is that there is no injury or consequence. there’s only so many times you can see characters outrun giant fireballs, without any of them getting burned. the movie really boils down to three sections, with three action scenes, each one very lengthy, with slow plot scenes in between. instead of one action scene an hour, this movie would have benefitted from more action spread throughout the duration. they could have been shorter scenes too. 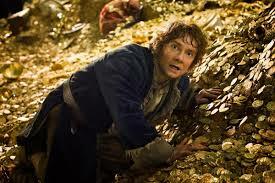 while the smaug scenes are all fantastic and thrilling, their is no conclusion to any of it. that goes for the movie as a whole, as well. it’s not so much that smaug needed to die, but that some kind of villain did. in a fight between legolas and an orc leader, at the end of the movie, things really seem setup for legolas to kill the orc and give us our climactic moment, like vigo mortensen did at the end of the fellowship of the ring. only nothing of that sort happens here. the desaulation of smaug is a pretty good movie, but with a few cuts and changes, it also could have been a lot better.